A review about the F-stop Tijuana photo backpack. A new model in the F-stop Millar series. The Tijuana is the casual backpack from the new Millar series. In this review I’ll tell you more about this backpack, the design and how it works in day to day use. F-stop is known for their high end Mountain series backpacks and bags for photographers that take their gear on active endeavors. The Mountain series bags are a little like the Tenba Shootout 24L I’ve reviewed recently (read my review about the Tenba Shootour 24L here), built to last and with details that active users will love. Those kind of bags are about versatility and comfort, but due to the way they are built they may not appeal to every photographer. 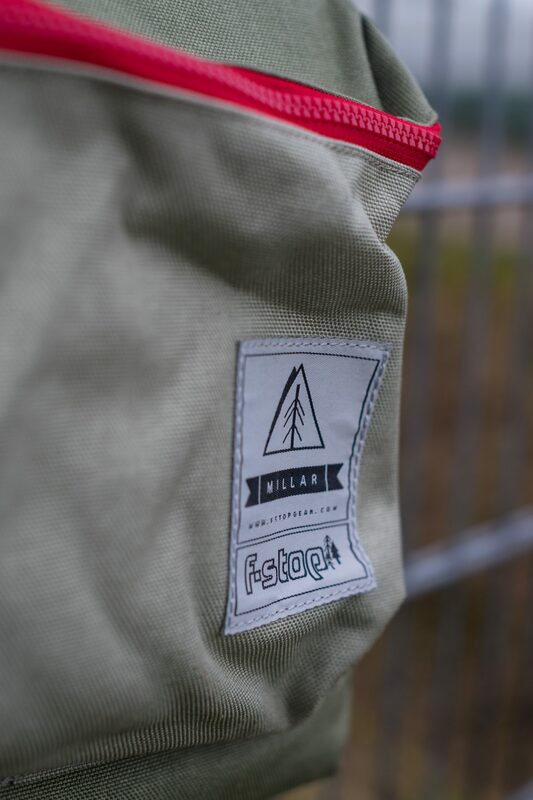 That’s why F-stop has (re-)introduced the Millar series, bags for the ‘mobile creative’. I’ll translate that to: casual bags for ‘cool’ people. There are several bags in the new Millar series, shoulder bags, slings and backpacks. The Tijuana is the biggest backpack in the new Millar series, to find out more about the Millar series check out the F-stop website at www.fstopgear.com. As you can see by the design of this bag it doesn’t look like a camera bag at all. This bag’s design reminds me of the backpacks I used in high school, those bags you would fill with loads of books and lug around the whole day. The big difference between those bags and this F-stop bag is the materials it’s made of. 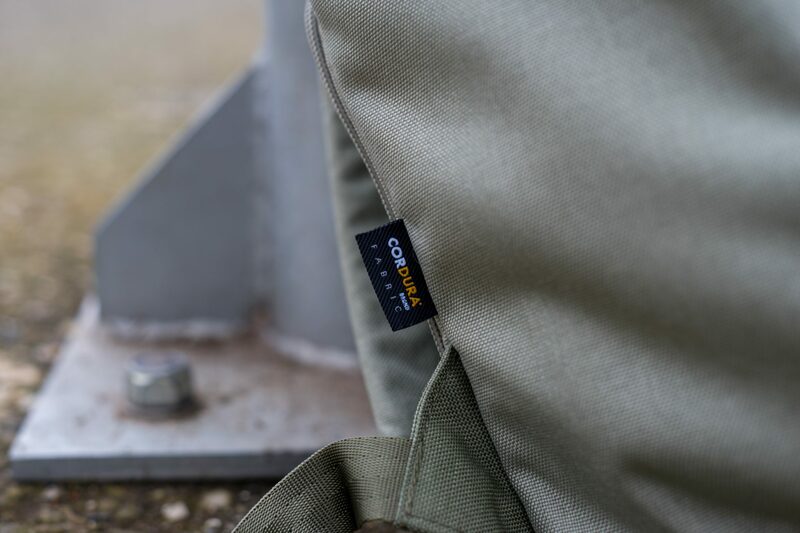 The Tijuana is made of a very durable and water resistant Cordura, that looks casual but is very tough and will keep your gear safe and dry for years on end. The bag is divided in two main sections. The top section is made for personal affects and can be accessed via the big zipper on the top of the bag. This is one of the points where you can see that F-stop hasn’t forgotten about their heritage, this bag is built to the same high standards as their Mountain series bags. 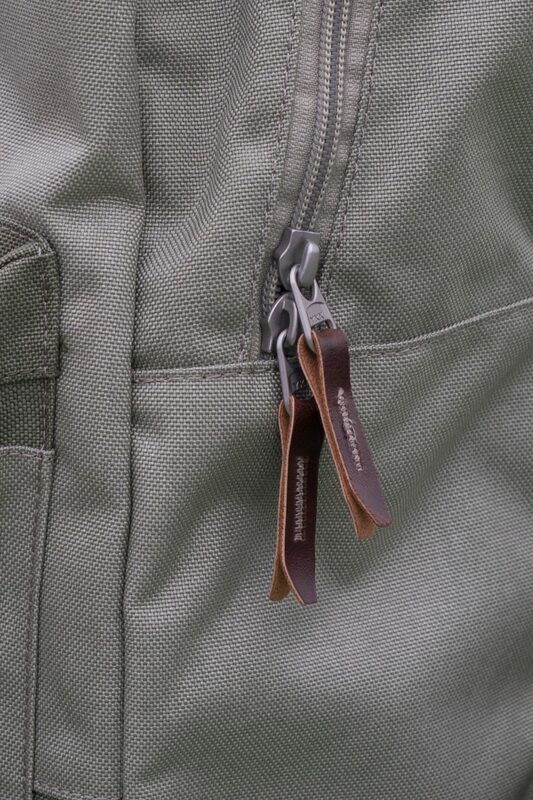 They’ve used high quality YKK zippers, with little pull tabs made of real leather. The top section is big enough to take all the stuff you need for a city or nature daytrip. The bag isn’t big enough to use as an overnight bag. F-stop has put an extra pocket on the inside of the main compartment big enough to fit a tablet (it fits my rather large Microsoft Surface, so an iPad or Android tablet will certainly fit without a problem). On the front of the bag there is an extra compartment behind a large red YKK zipper. In the compartment there are two lightly padded pockets to store more fragile items like a smartphone or photo-filters. 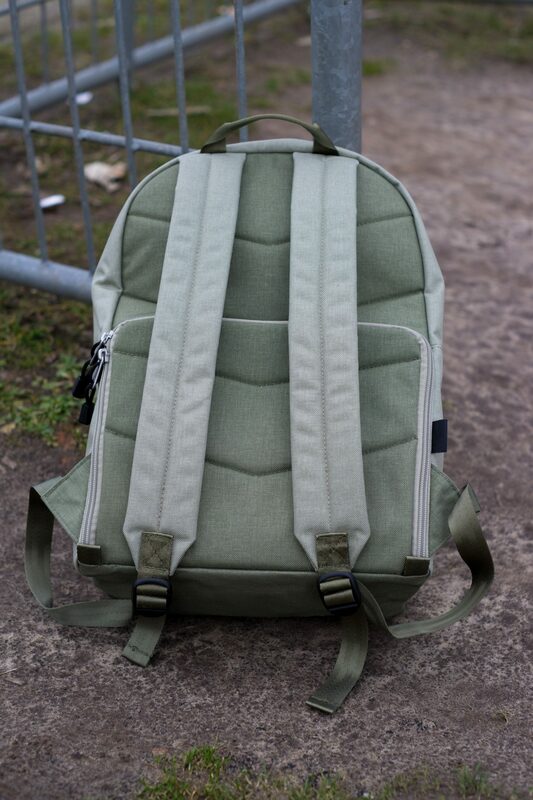 F-stop has put a big patch on the front compartment to show its heritage, looks cool. The most important compartment of the bag is opened from the back, the side that is against your back when you wear the bag. F-stop has also used YKK zippers on the back, but they’ve used smaller pull tabs on these zippers so they don’t poke your back. When you open the compartment you’ll find a rather roomy interior. There is enough room for my Sony A7 with the kit lens attached and for three other lenses or accessories. The compartment and the supplied dividers give you more than enough flexibility to adjust the space you have to fit your gear. It will even fit a large prosumer DSLR with a big zoom lens and one or to accessories. The camera compartment is padded with thick, soft materials so your camera is very well protected. 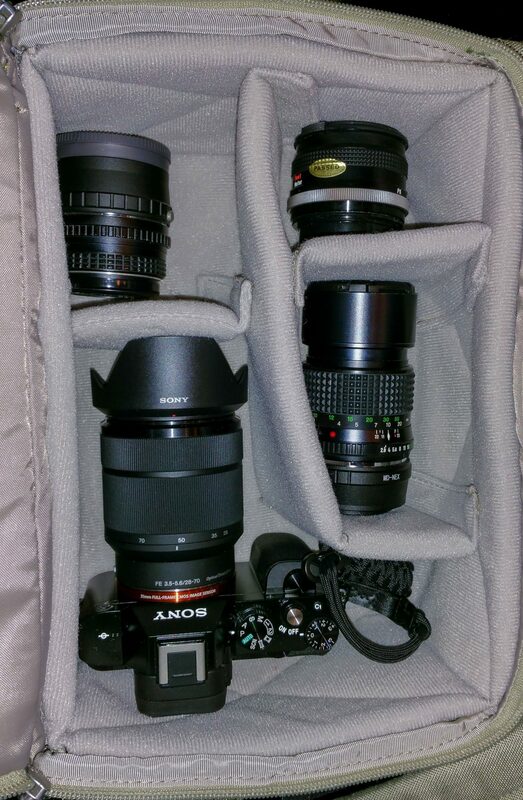 In the photo below you can see my Panagor 24mm in the top left compartment, my Sony FE28-70mm f3.5-5.6 in the bottom left compartment and the large compartment in the middle for my 135mm f2.8 Minolta (didn’t bring it this time), and of course the L-shaped compartment for my A7 with an attached lens. Click here for a photo of the Tijuana filled with my gear. What I really like about the design of this bag is that the padded compartment for your camera is easily removable. It’s attached to the bag with Velcro strips, so you can convert your camera bag to a normal backpack in matters of seconds. When you do that your left with a large backpack and still have a safely padded compartment to store your camera in. 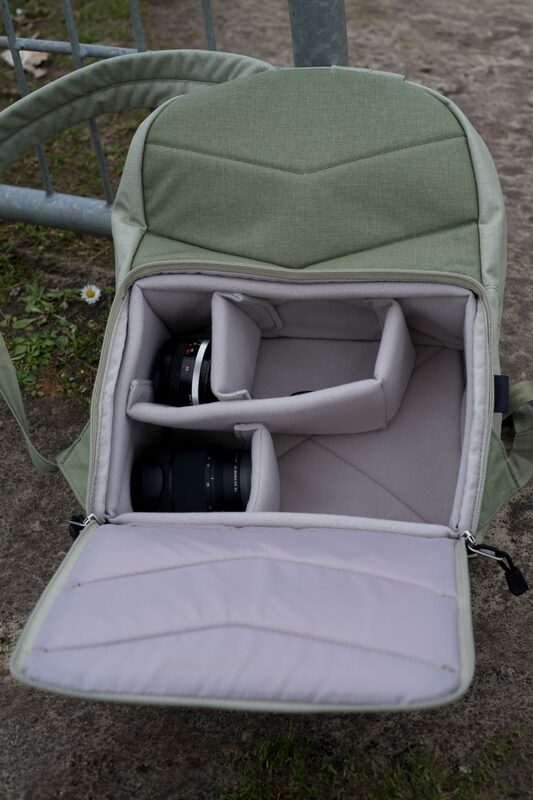 It would have been nice if F-stop had added a way to close the camera compartment with a flap or lid when you take it out of the bag, like Lowepro has done with their Photo Hatchback bag (I’m going to add a review about the Lowepro Photo Hatchback 16l AW soon). In day to day use you’ll notice how light this backpack is when it’s empty. Even filled with gear the Tijuana is light enough to lug around the whole day without it being an burden. Because the camera compartment isn’t enormous you can’t overload the bag with too much gear. That’s why it isn’t a problem that this bag doesn’t have fancy shoulder straps like the Tenba Shootout 24L has. Even without the fancy padded shoulder straps this bag is comfortable enough. You do have to watch out you don’t put too much heavy stuff in the top compartment so the bag doesn’t get to heavy. In my review about the Tenba Shooutout 24L I said I didn’t like the fact that the camera compartment opens from the front of the bag. On the Tijuana the camera compartment opens from the back, so you don’t have to worry about shady types trying to open your camera compartment when you walk around. And the second advantage of this design is that the side you put on your back doesn’t get dirty when you have to put the bag down on the ground to get your gear out. What is a shame is that F-stop hasn’t added an extra hatch in the side to grab your camera without putting the bag down on the ground. I really like that on the Tenba Shootout since it makes it easy to grab your camera when you are in a hurry to take a photo. But since the Tenba is about 2.5 times more expensive I can’t really fault this bag for that! Does mean you have to plan your photo moments. I liked using this bag. It doesn’t look like a camera bag, it’s light and comfortable and quite stylish. With the top compartment for personal stuff this is an ideal bag for a city trip or other getaway, when taking photo’s isn’t your main goal. 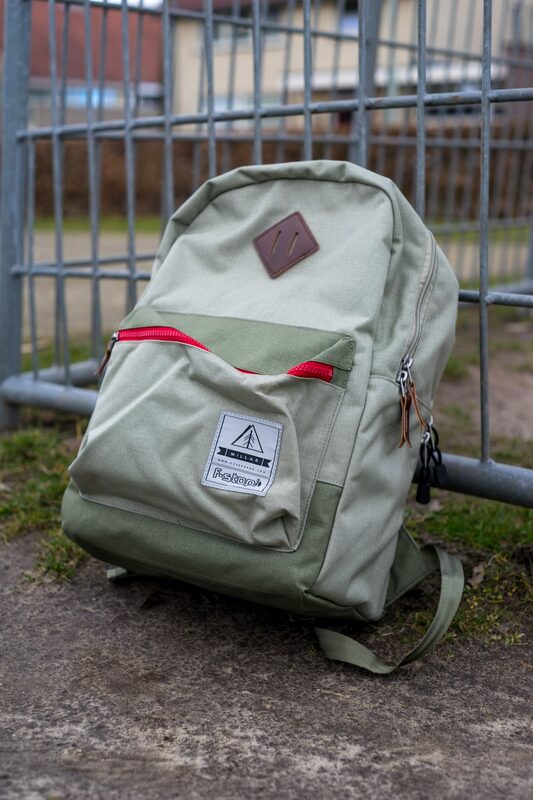 The retail price of this bag is about 100 euro’s, while that isn’t cheap, the bag is easily worth that. You’ll get a durable bag that is a pleasure to take with you on your daytrips. I’d like to thank F-stop for supplying me with their Millar series Tijuana backpack for this review. If you want to know more about F-stop, the Millar series or their other high end bags visit their website at www.fstopgear.com. Please note the F-Stop Millar series is still in public beta (mid 2015) and may not be widely available. Contact F-Stop gear customer support for more information (cs@fstopgear.com). Hi Rick- I found your review after a Google search. Do you have any idea what happened to the Millar series bags from F-Stop? They seem to have disappeared from their website. Hi Tom, just checked and I see you’re right. It seems they have taken the complete Millar series off of their site and online shop. I’ve E-mailed my contact at F-Stop, I hope he can tell me more. I’ll let you know if he replies. F-Stop replied and let me know the Millar series is still in public beta phase. That means they have limited stock. If you are interested you can reach out to F-Stop Customer support (cs@fstopgear.com) for more information about when they will be widely available.